A little fashion always brightens my day, even if it’s a day that I feel like heaving (thanks FBC!). 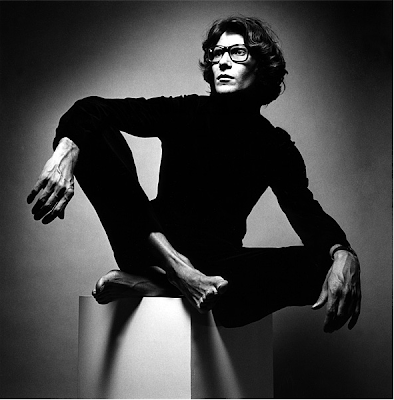 I am a big fan of Yves Saint Laurent. Stefano Pilati is brilliant and has carried on the vision of Yves Saint Laurent. For the resort collection, he has included a clover print…yes, a clover print. (The Irish girl in me is THRILLED! I am loving the Yves Saint Laurent advertising campaign for Spring 2011. Last summer, we had the opportunity to go to the first-time retrospective exhibition of Saint Laurent’s entire body of work spanning 40 years at the Petit Palais.The curators succeeded in synthesizing an enormous body of work in order to show the harmony in Saint Laurent’s creations. It was a magnificent show! 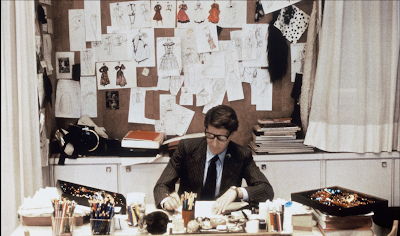 Above: Yves Saint Laurent in his own studio, 1986. The exhibit recreated his exact office, including a pair of glasses on the table. It was brilliant. My two favorite rooms were the one above, which included his first collections, and the one that included literally thousands of fabric swatches. The entire exhibit was extraordinary though. 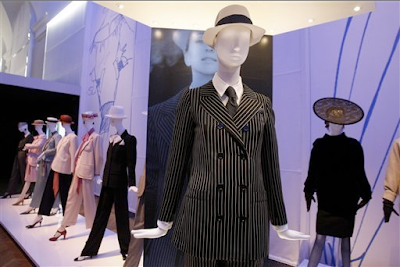 I am incredibly fortunate to own several pieces of vintage YSL (most purchased from Decades in Los Angeles), which I treasure even more after seeing this exhibit. What a SL (silver lining) memory to add to this day.